Makeup File with Natasha: Get Fauzia Aman’s Gilded Look in Ayesha Hasan’s Shoot! Fauzia Aman’s makeup styled by Natasha in this latest shoot for Ayesha Hasan by Ayaz Anis is a must learn simply because the beautiful technique she has utilized is classic yet edgy and would look sublime on every girl. In line with the bridal couture theme of the shoot, Natasha has infused a heavy formal look but at the same time, one that is modern and and not restricted to the traditional bride. More than anything there is plenty of luminous texture and hypnotic sensual eye makeup. Here’s the scoop she shared exclusively with Secret Closet on how she did it plus a few of her own special tips just for you. “With this shoot we wanted to capture both a bridal feel as well as give it a more high fashion edge. It is a twist on the traditional for example for the hair Hina styled a classic ‘Khajoori braid’ with a mohawk twist in which she inserted decorative leaves sprayed gold. For another style she tied a textured rope braid with delicate small flowers for effect. Eyes: For this shoot the eyes were all about shimmer in both gold and silver, hues I love using for party makeup. I contoured using heavy glitter for eyes that popped and sparkled mixing in gold and silver for a Ganga-Jamni effect followed by thick winged eyeliner, rather than a smokey eye. Gold glitter was mixed in a special product called ‘Duraline’ by ‘Inglot’ that converts powder to a thick liquid, so it works well to ensure the glitter sticks to your eye lids rather than the rest of your face. For the waterline I used kohl Bobbi Brown eye pencil, a current favorite of mine as it’s so soft it smoothly glides across. Eye pencils that need to be rubbed hard are harmful for your skin so need to be avoided. I wanted the eye brows thick so I contoured them with an angled brush using M.A.C in ‘Corduroy’. Skin: To create more modern elements withing bridal makeup I wanted to give Fauzia’s skin a metallic gold tinge. I prepped her skin using Makeup Forever High Definition Primer. To give her a warmer tone and insert a high fashion component I used one shade darker than her actual skin tone. This resulted in a more bronzed finish. I used the M.A.C Blush in ‘Margin’ which is a lovely peach gold hue on her upper cheek bone for a luminous shine followed by ‘Peach’ by M.A.C on the main cheek area. For the under eye area I decided to go lighter than the actual skin tone. The way to do this and a technique often used by Kim Kardashian is to first use your own shade if you have darker under eyes and then follow with a lighter shade to avoid the unseemly grey effect. I prefer Makeup Forever Lift Concealer that has great coverage and gives a fresh awakened appearance. To enhance the bronzed skin I used NARS ‘Laguna’ which is a great matte bronzer. This is important as bronzers inclusive of shimmer result in a muddy appearance. Instead use a separate shimmer such as Smashbox. 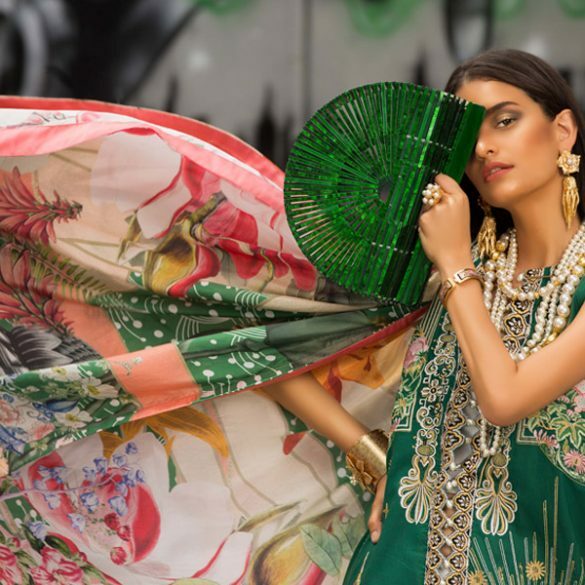 “Natasha” is the debut project of “House of Noor”, a company formed as a tribute to the legendary Madam Noor Jehan by her granddaughters, Natasha and Sabrina Khalid. The namesake of the studio is one of the eldest granddaughters of Madam, a highly qualified and gifted makeup artist. Encouraged and inspired by Madam’s distinctive beauty, glamorous style and larger-than-life aura, Natasha developed a fascination for transformations through makeup, clothes and styling from a very early age. She went on to pursue her passion on a professional level by completing an extensive professional makeup course from the prestigious JEMMA KIDD MAKEUP SCHOOL in London. Having trained under renowned Makeup Artist, David Horne (previous head of MAC UK and Germany, current trainer for Illamasqua), Natasha was able to fine tune her skills to understand the art of make-up at a much deeper level. Once her training in London was complete, Natasha worked in the Middle East as a Makeup Artist and Qualified Trainer for MAC Cosmetics for three years. She rapidly gained a loyal clientele for her party and bridal makeup in Abu Dhabi and Dubai, becoming the Beauty Expert for Friday Magazine and Beauty Consultant for Kaya Skin Clinic. Natasha’s editorial portfolio boasts of collaborations with cosmetic giants such as Bobbi Brown, Illamasqua,YSL, Gucci, Lancome, Body Shop, Bourjois, MAC and Mikiyaji, among many others. She has also headed the makeup team for the fashion shows and lookbooks of several UAE designers such as Essa for his finale of Dubai Fashion Week 2008 as well as Buffi Jashanmal’s look book for New York Fashion Week. After gaining vast practical experience on a global platform, Natasha and her sister Sabrina, have decided to bring their new found awareness and the glamour quotient of the international beauty world to Pakistan. Having begun 10 months ago – the team has already worked on innovative campaigns for Gul Ahmed, Labels, Everyday Milk, Sonya Jehan for Natasha Salon, Mausummery Lawn, Sania Maskatiya, Mina Hasan, Sonya Battla, Nadia Elahi, Nauratan as well as celebs such as Sanam Chaudri & Hira Tareen for Lux Style Awards! To be truly GLAMFORMED head over to their salon. Interview: Yasmeen Jiwa on 'YJ' & the Road Ahead!